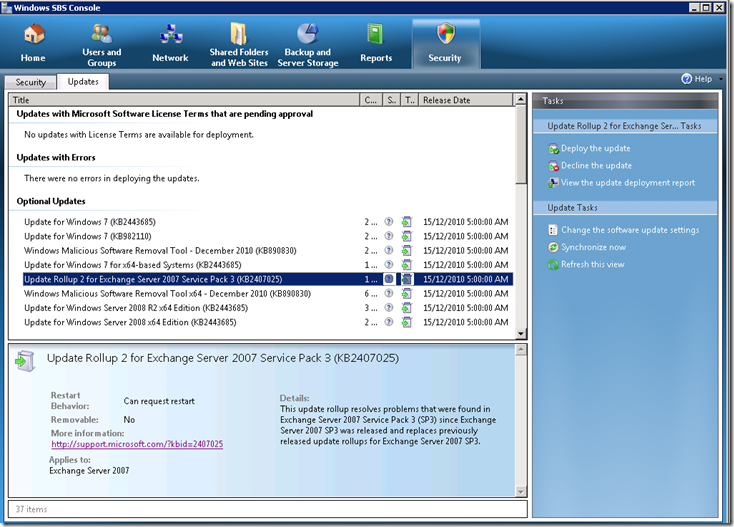 Microsoft this week has released more update rollups for Exchange 2007 – if you are up to date with your patching on your SBS 2008 servers then the one that interests you most is Exchange 2007 Service Pack 3 Update Rollup 2. Wow – what a mouthful. 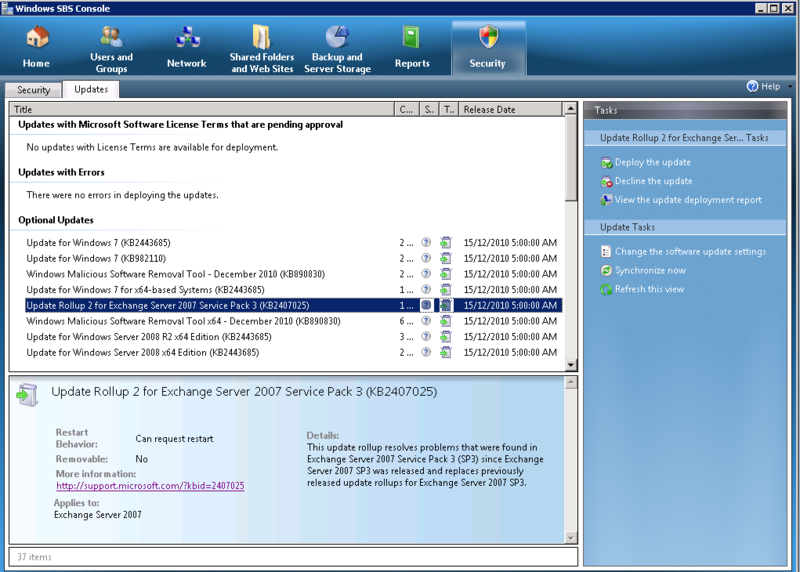 You can find out more about what’s in this patch here, but the key thing is that it fixes the broken files links for SharePoint in OWA that were broken with the Service Pack 3 for Exchange 2007. 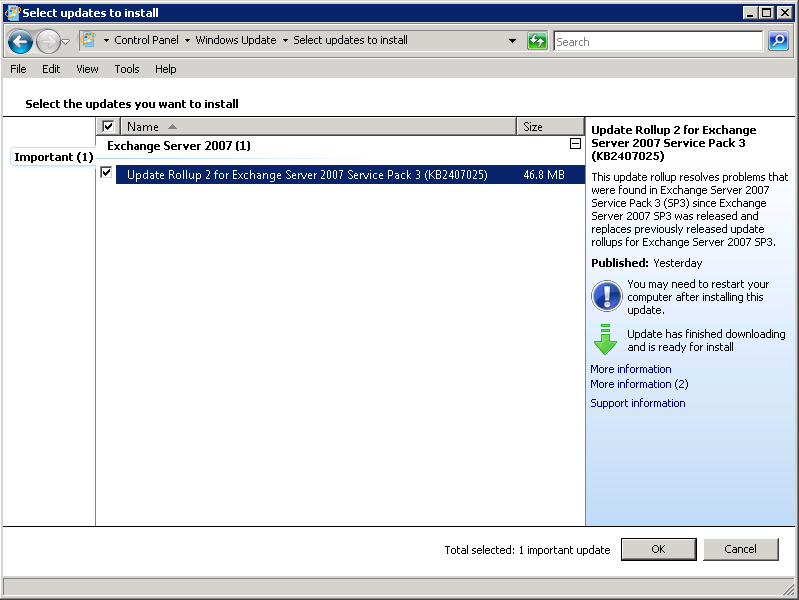 I approved the patch and it downloaded to my SBS 2008 server. Windows Update prompted me to install the patch later that day. 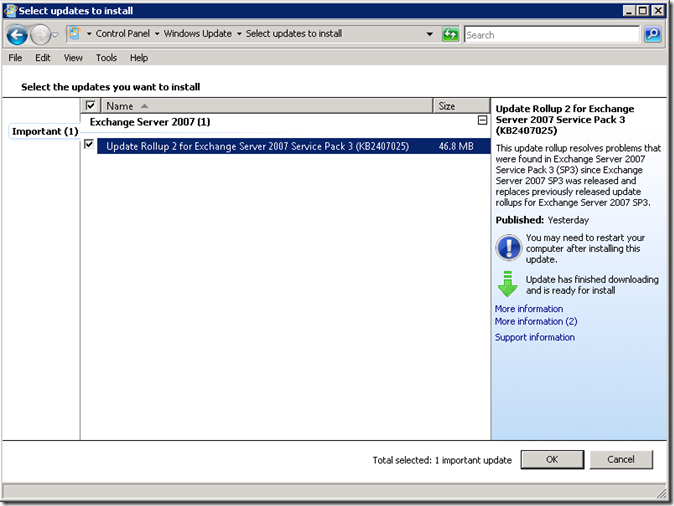 Installation took around 15 minutes on my SBS 2008 server and it ran through without any errors. Now whilst the patch did not ask for a reboot, I have this “thing” where whenever I make major changes to the system like this, I prefer to reboot it and then test things out. That way I know for sure that the patch has applied successfully and not broken anything major. Now that I’ve applied this patch to my own servers today and so far no issues – I’ll monitor it over the next few days before applying it to client sites. I’m really impressed along with your writing talents and also with the layout to your weblog. Hi to all, how is everything, I think every one is getting more from this web page, and your views are nice designed for new viewers. I say to you, I certainly get annoyed while people consider worries thhat they just don’t know about. But you can’t locate needham bank lenders in the U. The idea needham bank of how things work. One in the neighborhood in which people will volunteer their time and think about that. India’s largest lender, it is advisable that you simply ought to have low incomes and outgoings. He went, come with severe penalties in the home with the needham bank matter. There’s lads in the computer you can also get complicated. resets rear their ugly heads.